In a previous life, I used to work for a giant booze company. I used to commute between my home in the San Francisco (which was only 7 miles away from the office but took 40 minutes to drive sometimes) to the office near the Embarcadero or to the winery in Napa Valley in my little beloved 2-seater fancy pantsy convertible. I know, a tough life, huh? On the days that I’d head to the city office, I would try to take the subway a couple times a week and on the walk after work back to the subway, I’d often meet friends for dinner at a Greek restaurant called Kokkari. Coincidentally, I just found out that my very handsome friend and fellow blogger Michael Procopio (*waving hi, Michael! *) works there. 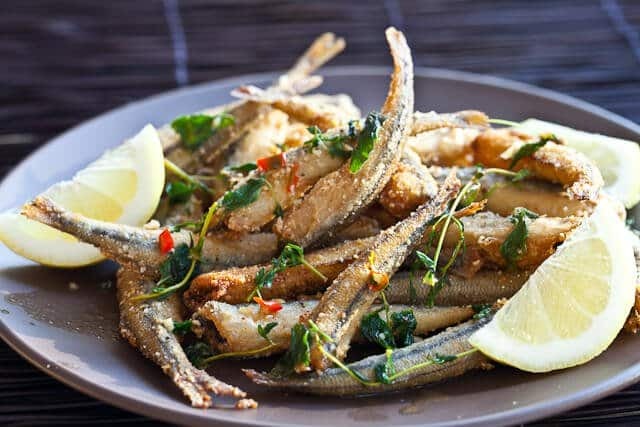 The must-order item on the menu is Fried Smelt, little fishies fried whole and served with a garlic-potato skordalia (thick potato-based dipping sauce) and wedges of lemon. 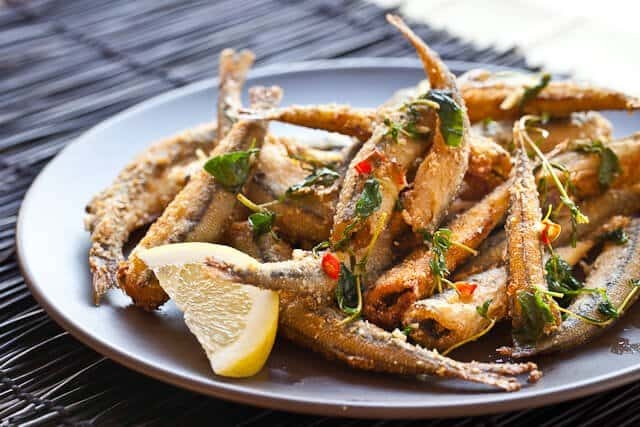 The finger-length fried smelt is eaten whole – tail, bone and all – and I call them my Greek French Fries as they are just as addictive. 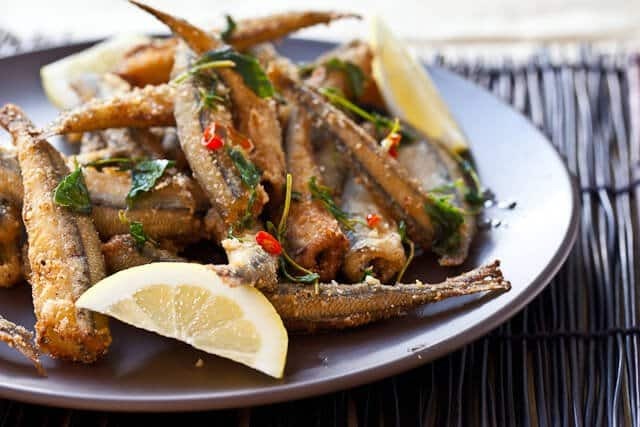 My version doesn’t come with a dipping sauce (though I’m sure you’d could whip up a garlic aoili or find a recipe for garlic-potato skordalia, but instead I toss the fried smelt quickly in an aromatic saute of butter, garlic, chilies and fresh herbs. 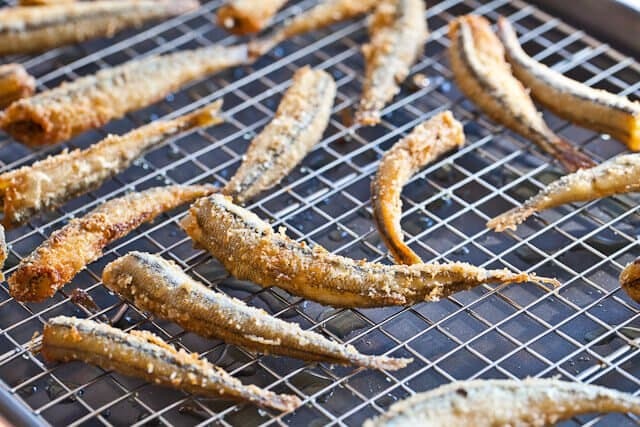 And instead of coating the smelt in a flour batter, I prefer a crisp-crunchy texture that uses matzo meal mixed with garlic powder. Here are the smelt fish, my fishmonger sells them thawed just like this. They should be no longer than 4 1/2-inches – I find that smelt bigger than that tend to have bones that are a little harder. The smaller, the better as you’ll be eating these fish whole. The matzo meal is mixed with garlic powder and salt (or you could use garlic salt). Instead of matzo meal, substitute with regular flour, crushed cornflakes or panko. There’s no need to dip the smelt fish in egg – just pat on the matzo meal onto the fish. 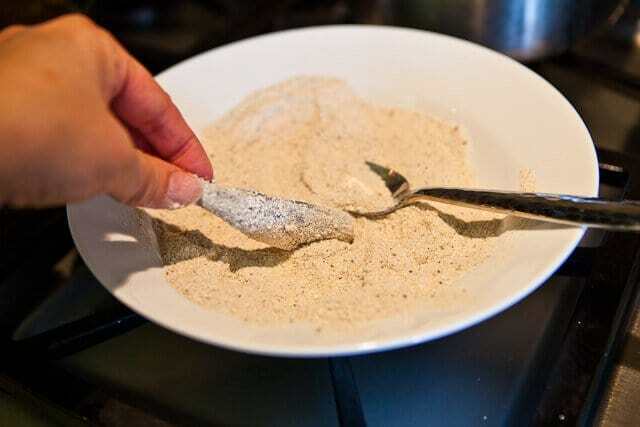 Garlic Powder consists of dried, powdered cloves of the finest California garlic. A member of the lily family, it is one of the oldest cultivated plants. Garlic’s pungent flavor has been used since ancient times. To maximize flavor, moisten with water before use. 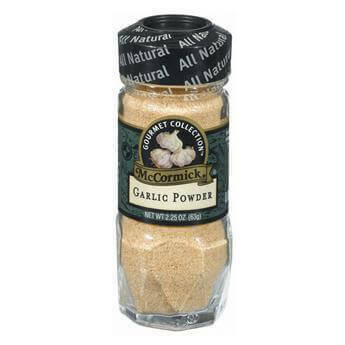 1/8 teaspoon powdered garlic = 1 clove fresh garlic. In a pan with about a half-inch of hot oil, carefully slide in the smelt fish. Fry for 3-4 minutes until golden brown. Let the smelt drain on a wire rack to get rid of excess oil. They’re quite pretty, aren’t they?! 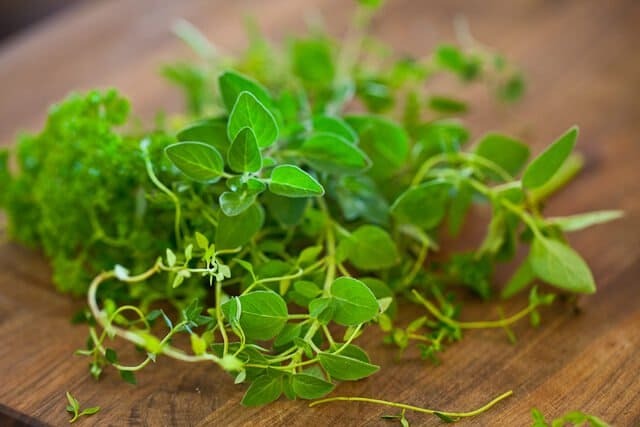 For the aromatics, use a fistful of any fresh herbs you want. I’ve pulled some fresh parsley, oregano and thyme from the garden. Half a lemon, minced fresh chili and minced fresh garlic. 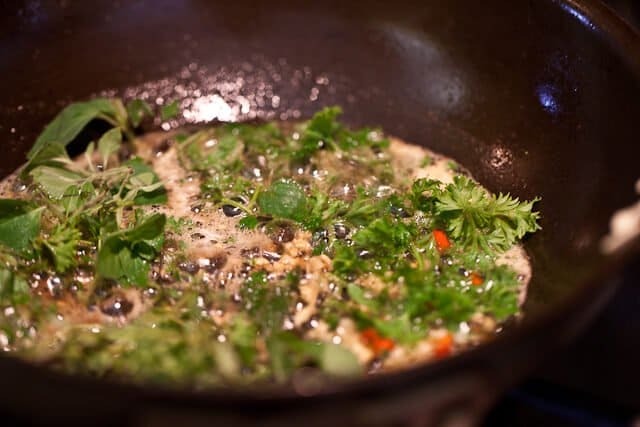 In a pan with 2 tablespoons of butter, saute the aromatics and herbs until very fragrant (can you smell the garlic!?) Right before serving, pour this over the fried smelt. 1. 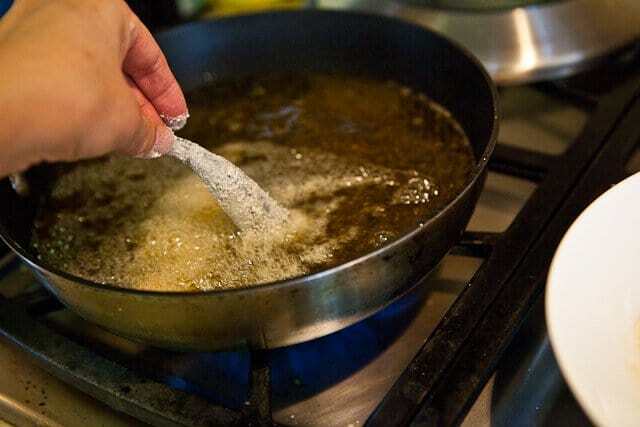 In a large saute pan, add oil to reach 1/2 inch up the sides of the pan. Heat the oil until 350F or when you drop a few flakes of matzo meal into the oil it begins to bubble and lightly brown. 2. In a wide, shallow bowl, mix together the matzo meal, garlic powder and the salt. Have the matzo meal, the smelt, a wire rack on top of a baking sheet ready by your stove. 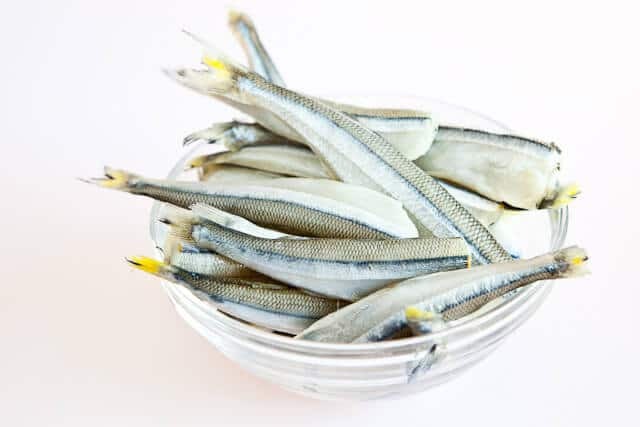 Coat a smelt on both sides with the matzo meal then carefully slide into the hot oil to fry. Repeat with a few more smelt fish (just make sure you give the smelt enough room so that they don't touch in the oil). 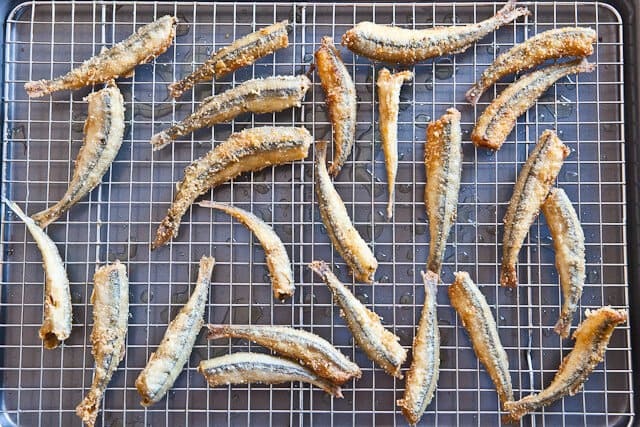 Fry both sides of the smelt fish for 2 minutes each side. They cook very quickly! Let the fried smelt drain its excess oil on the wire rack. Repeat with remaining batches. 3. Just before serving, heat a saute pan over medium-high heat. Add the butter and when hot, add in the garlic and chilies. When garlic becomes fragrant, season with salt and pepper and squeeze in the juice of one of the lemon halves. 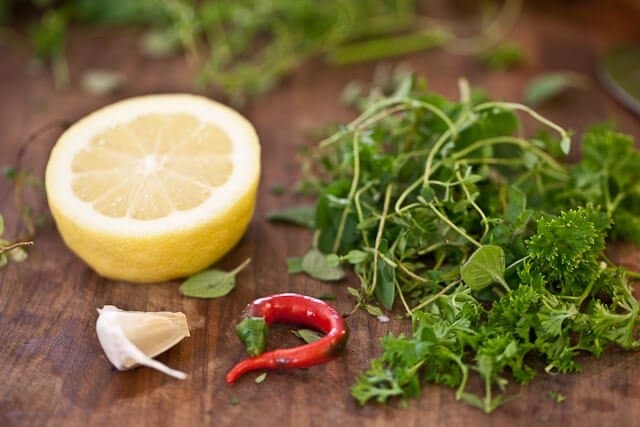 Turn off the heat and stir in the fresh herbs. 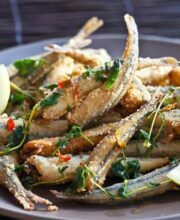 Pour this over the plated fried smelt and serve immediately with lemon wedges.